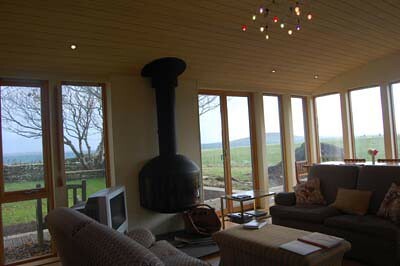 Everything west of Kirkwall is known as West Mainland, an area of rich farmland, rolling hills and moorland, fringed by spectacular cliffs along the Atlantic coastline and with the greatest concentration of pre-historic monuments in Britain. 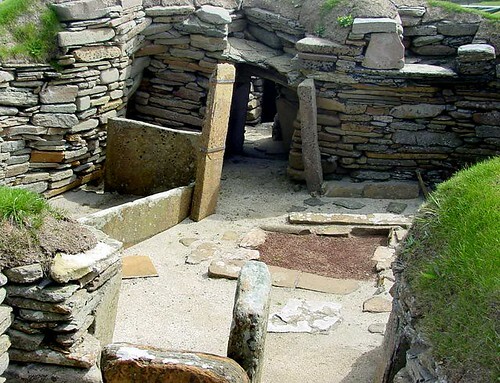 At the far northwestern corner of the Mainland is the parish of Birsay, which was a favourite residence of the Earls of Orkney in Viking times as well as the first seat of the Bishop, before the building of St Magnus Cathedral in Kirkwall. Earl Thorfinn the Mighty lived here (1014-64) and built Orkney's first cathedral, Christchurch, for the new Bishop. In the centre of the village are the ruins of the Earl's Palace, built by the infamous Earl Robert Stewart in the late 16th century, and once described as "a sumptuous and stately dwelling". Not much remains today, but enough to give some idea of the sheer scale of the place. Info - Open at all times. Free.Tel. 01856-721205. Close by is St Magnus church, built in 1760 on the site of an earlier church, which in turn was built on the foundations of what is believed to be the original Christchurch. Also in Birsay, just south of the A966 and A967 junction, is Barony Mills, the last working water-powered mill in Orkney. Info - Apr-Sep daily 1000-1300 and 1400-1700. Adult £1.50. Lying half a mile off the coast near the village is the Brough of Birsay, a tidal island jutting out into the north Atlantic and visible from several other points all the way down the west cost of the mainland. It is only accessible for a couple of hours at low tide (times available from Kirkwall and Stromness tourist offices) but, if possible, it is best seen at the end of the day, as the sun sets - and you'll probably have the whole island to yourself. Pick your way over the shell- and bladderack-strewn causeway and wander at your leisure (but don't forget the tide!) amongst the remnants of a Pictish, and then Viking, community. 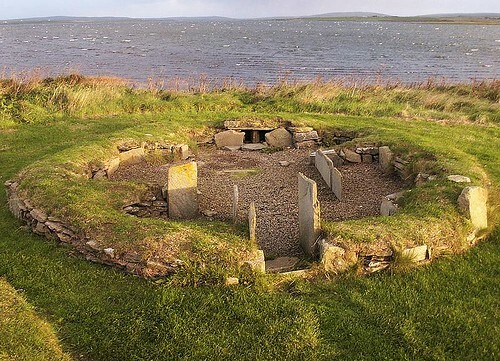 The island was an important Pictish settlement from around the sixth century, and many artefacts have been found here. Some of these can be seen at the small ticket office at the entrance to the island. 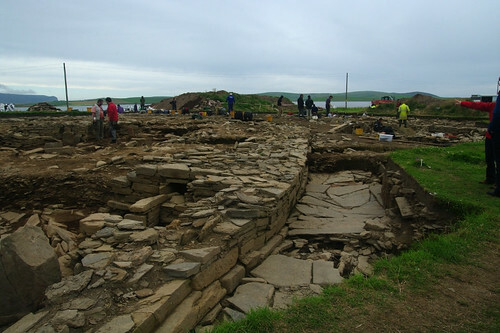 The Brough was also the site of an important Viking settlement, and there are extensive remains, including the 12th-century St Peter's church where St Magnus was buried after his murder on Egilsay. You can also walk out to the island's lighthouse along the top of the cliffs and see puffins (amongst other migrating seabirds) and possibly Minke whales, Pilot whales and Killer whales. Info - The tidal island is now managed by Historic Scotland. Open (when tides permit) 11 Jun-30 Sep daily 0930-1830. Adult £1.50, concession £1.10, children £0.50. Phone the Earl's Palace (see above). At the southern end of Birsay Bay are the wild and spectacular 300 ft-high cliffs of Marwick Head, topped by the distinctive Kitchener Memorial, erected after the First World War to commemorate Lord Kitchener and the crew of the HMS Hampshire, which was sunk by a German mine off the coast in 1916 with the loss of all but 12 of her crew. Marwick Head is also an RSPB Reserve, and during the nesting season in early summer is home to many thousands of guillemots, razorbills, kittiwakes and fulmars, as well as a few puffins. 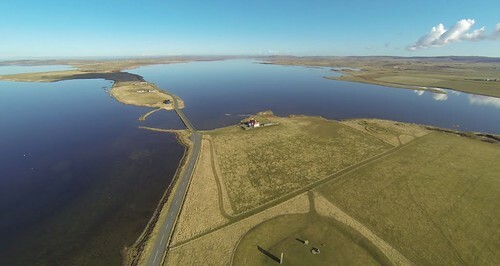 A mile inland, by the Loch of Isibister, is another RSPB reserve, The Loons, an area of marshland where you can see breeding and migrating wildfowl and waders. Further east, between Boarhouse Loch and Hundland Loch, is the Kirbuster Farm Museum, the last surviving Orkney 'black house' which was inhabited till the 1960s and gives an insight into 19th-century rural life on the islands. Info - Mar-Oct Mon-Sat 1030-1300 and 1400-1700, Sun 1400-1900. Free. A short distance inland from Skara Brae (see separate entry below), at Sandwick, is Orkney's only brewery, housed in the old Quoyloo School. It brews the island's Raven Ale and various bottled beers, including Skull-splitter, named after the Viking Earl, Thorfinn Skull-splitter. South of the Bay of Skaill is Yesnaby, one of the most spectacular places on the islands, where the cliffs have been eroded into a series of stacks and geos by the fierce Atlantic seas. An exhilarating, and precarious, half-mile walk south from the car park and old Second World War lookout post brings you to Yesnaby Castle, a huge sea stack similar to the Old Man of Hoy. It's a dramatic sight, especially in a full force gale. 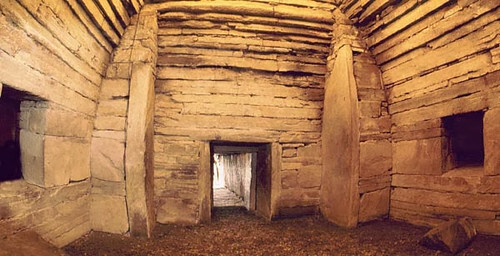 The best preserved stone age village in Europe: an extraordinary insight into life 5000 years ago.